Periodontal disease (gum disease) begins as an accumulation of plaque on the surface of teeth near the gum line. If the plaque by regular brushing and flossing, the plaque will harden into calculus (tartar). Next the gums will become red, swollen, and irritated. This is known as gingivitis and is the beginning of periodontal disease. If left untreated, gingivitis will progress into periodontal disease. Periodontal disease destroys the gum tissue and bone levels around the teeth. When the support structures around the teeth are lost, the teeth become mobile. Periodontal disease is a major cause of tooth loss. Furthermore, periodontal disease can contribute to heart disease, diabetes, and other health problems. Also, periodontal disease during pregnancy has been linked to premature birth or low birth weight. Family members that have had gum disease. If you have been diagnosed with periodontal disease, Dr. Nugent always starts with the least invasive options, which are non-surgical. The first treatment against gum disease is a cleaning technique known as “scaling and root planning.” An ultrasonic cleaning device is used to remove plaque and calculus (tartar) from your teeth. 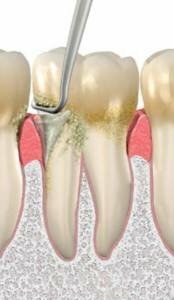 Scaling the root surface will remove bacterial colonies and calculus from your teeth. Then the rough surface of the tooth root is smoothed out. This creates a healthy, clean smooth surface that makes it easier for gum tissue to reattach to the tooth now that the bacteria and calculus is gone. As with any dental procedure, home care is vital. In order to prevent relapses of periodontal disease, you must brush and floss daily, eat a healthy diet, avoid tobacco use, and schedule regular dental checkups. Even after a successful periodontal disease treatment, if you don’t take care of your teeth and gum tissue, you are likely to develop gum disease again. Dr. Nugent is a General Dentist in Pasadena, Texas. He is a dental leader in the area due to his commitment to superior dentistry. Multiple times Dr. Nugent has been voted “Best Pasadena Texas Dentist“. Discover award wining dentistry for you and your family. Call us today at 713-941-8261 or visit us at 3421 Burke Rd Ste A, Pasadena Texas.